Question 1: Draw a line segment of length 7.6 cm and divide it in the ratio 5 : 8. Measure the two parts. Solution: Draw a line segment AB = 7.6 cm. Draw a ray AX which makes an acute angle with AB. Through the point A5, draw a line A5C || A13B; which intersects AB at point C.
Question 2:	Construct a triangle of sides 4 cm, 5 cm and 6 cm and then a triangle similar to ti whose sides are 2/3 of the corresponding sides of the first triangle. Draw an arc at 5 cm from point A. Draw an arc at 6 cm from point B so that it intersects the previous arc. 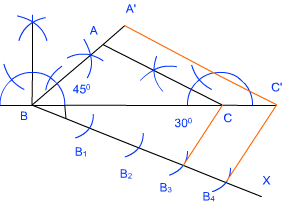 Joint the point of intersection from A and B. This gives the required triangle ABC. Draw a ray AX at an acute angle from AB. Draw a line from point A2 so that this line is parallel to A3B and intersects AB at point B’. Draw a line from point B’ parallel to BC so that this line intersects AC at point C’. 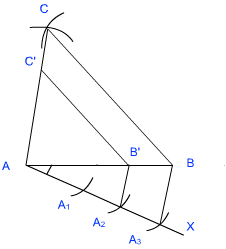 Triangle AB’C’ is the required triangle. Question 3:	Construct a triangle with sides 5 cm, 6 cm and 7 cm and then another triangle whose sides are 7/5 of the corresponding sides of the first triangle. Draw an arc at 6 cm from point A. Draw an arc at 7 cm from point B so that it intersects the previous arc. Draw a ray AX at and acute angle from AB. Plot seven points on AX; so that AA1 = A1A2 = A2A3 = A3A4 = A4A5 = A5A6 = A6A7. 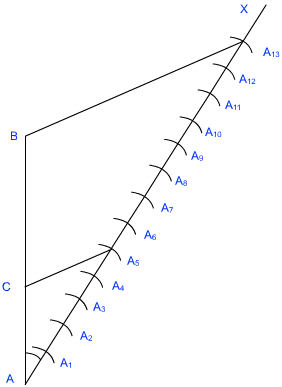 Draw a line from point A7 parallel to A5B so that it joins AB’ (AB extended to AB’). Draw a line B’C’ || BC. Question 4:	Construct and isosceles triangle whose base is 8 cm and altitude 4 cm and then another triangle whose sides are 3/2 times the corresponding sides of the isosceles triangle. Draw a line segment AB = 8 cm. 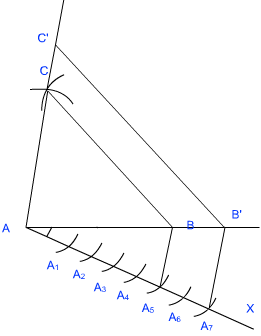 Draw two intersecting arcs at 4 cm distance from points A and B; on either side of AB. Join these arcs to get perpendicular bisector CD of AB. (Because altitude is the perpendicular bisector of base of isosceles triangle). Join A and B to C to get the triangle ABC. Draw a ray DX at an acute angle from point D.
Plot 3 points on DX so that DD1 = D1D2 = D2D3. Join D2 to point B. Draw a line from D3 parallel to D2B so that it meets the extension of AB at B’. Now, draw B’C’ || BC. Triangle A’B’C’ is the required triangle. Question 5:	Draw a triangle ABC with side BC = 6 cm, AB = 5 cm and ∠ABC = 60o. 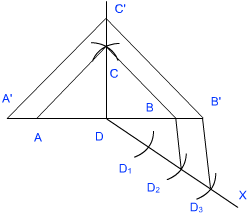 Then construct a triangle whose sides are ¾ of the corresponding sides of the triangle ABC. Draw a line segment AB = 5 cm. Make a 60o angle from point B and draw BC = 6 cm. Join A and C to get the triangle ABC. Draw a ray at an acute angle from BA. Plot 4 points on BA so that BB1 = B1B2 = B2B3 = B33B4. Join B4 to point A. Draw a line from B3 parallel B4A so that it meets AB at point A’. 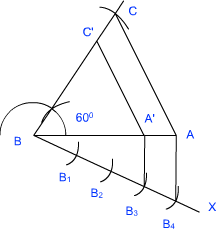 Triangle A’C’B is the required triangle. Question 6:	Draw a triangle ABC with side BC = 7 cm, ∠B = 45o, ∠A = 105o. Then construct a triangle whose sides are 4/3 times the corresponding sides of triangle ABC. Draw a line segment BC = 7 cm. Make an angle of 45o at point B and an angle of 30o at point C (because 45 + 30 + 105 = 180). Join the lines from points B and C at point A. Draw a ray BX at an acute angle from point B. Plot 4 points on BX so that BB1 = B1B2 = B2B3 = B3B4. Now, draw a line from B4 parallel to B3C so that it meets line BC at C’. Triangle A’BC’ is the required triangle. Question 7:	Draw a right triangle in which the sides (other than hypotenuse) are of lengths 4 m and 3 cm. Then construct another triangle whose sides are 5/3 times the corresponding sides of the given triangle. Draw a line segment AB = 3 cm. Make a right angle at point A and draw AC = 4 cm from this point. Join points A and B to get the right triangle ABC. Plot 5 points on AX so that AA1 = A1A2 = A2A3 = A3A4 = A4A5. Join A3 to point B. Draw a line from A5 parallel to A3B so that it meets AB at point B’.